This tutorial provides you with a foundation for working with Adobe Photoshop Elements creations. It is the tenth lesson in the Adobe Photoshop Elements 10 Digital Classroom book. Photoshop Elements offers a variety of ways to enhance and share your photos with others. Slide shows, photo books, calendars, and collages can easily be created. If you have photos of a wide scene, like a landscape, you can join them together into a single image. In the next exercise, you’ll use a series of four incremental photos of a river running through farmland. The strong, distinctive lines that are running through the pictures make this a good candidate for creating a panorama. 1 In the Organizer, type farmland in the Search text field to display the four images that you’ll use to create the panorama. Select all four images by clicking on the first image, then Shift+clicking on the last image and choose File > New > Photomerge Panorama. 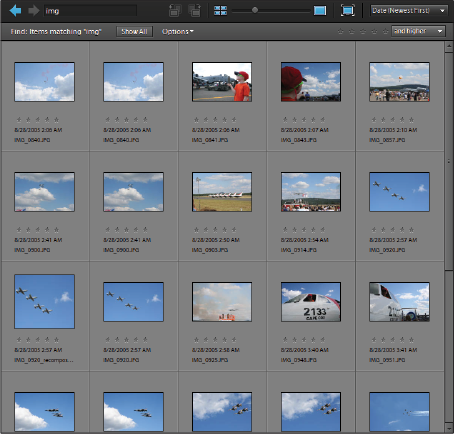 All four images are opened in the Photoshop Elements Editor and the Photomerge dialog box appears. 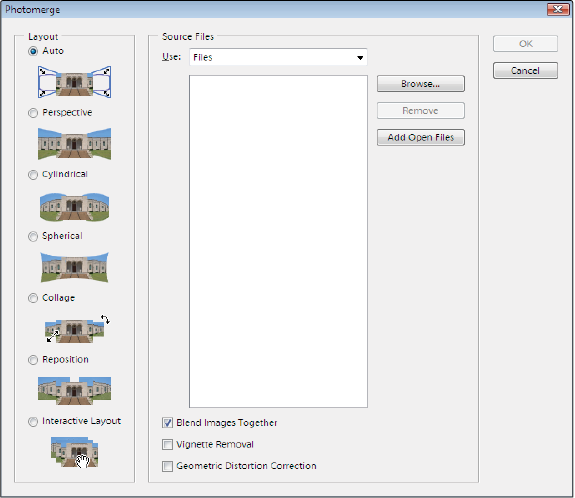 2 In the Photomerge dialog box, leave Auto chosen in the Layout section to allow Photomerge to determine the best layout method based on the analysis it performs of the images during the Photomerge process. Leave Files chosen in the Use drop-down menu and click the Add Open Files button to add the open files in the Editor to the list of files in the Photomerge dialog box. 3 Press OK and wait while Photoshop Elements opens and closes windows to create your panorama. The panorama is a new document with four layers arranged to align the different images. The number of layers depends on the number of individual images you used in the Photomerge process. Each image is converted into its own layer, and any areas that are extraneous—the ones that aren’t needed to produce a completed panorama—are masked out and hidden using a layer mask for maximum flexibility if editing is needed. The Photomerge process always creates an excess background area that must be cropped. 4 When Photoshop Elements is finished processing the image, a dialog box appears asking if you’d like to fill in the edges of your panorama. Click Yes. This feature utilizes the new content-aware technology that can fill in areas intelligently by analyzing surrounding pixels to create a seamless transition between existing pixel information and new pixel information. The panorama after allowing Photomerge to fill in the edge pixels. As you can see, the content-aware technology built into Photoshop Elements 10 does an amazing job of filling in areas in a realistic way. Although it did a great job in the sky area, the grass contains some repeat patterns that causes the foreground to look unrealistic. You’ll crop that out in the next step. 5 Select the Crop tool ( ) from the Toolbox and draw a marquee around the image to crop out some of the foreground area. Crop out as much of the bottom of the image as needed in order to remove the majority of the repeat pattern created by the filling of the edge pixels. 6 Click the green checkmark at the bottom of the crop window to finalize the crop. 7 Select File > Save. Name the file My Panorama, and confirm that Photoshop is set as the file type, that the Lessons folder is the location, and that the Include in the Elements Organizer checkbox is enabled. Press Save. 8 Choose File > Close All to close the panorama and all four of the original Farmland images. A slide show is fun to build. It allows you to combine images, music, narration, and text to create a unique multimedia display. 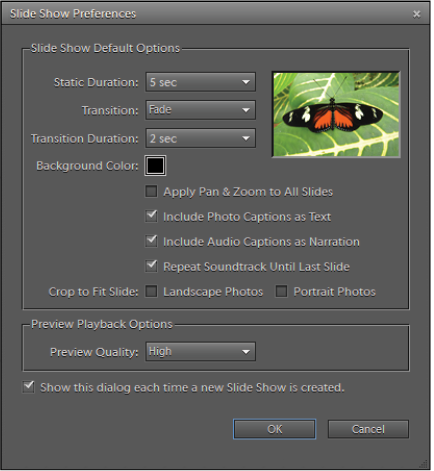 Like most photo creations in Photoshop Elements, slide shows can be created from the Organizer, or the Editor. The easiest place to create them is the Organizer, as you will discover in the following steps. Note that the Slideshow feature is only available in the Windows version of Photoshop Elements. If you are using Photoshop Elements on the Mac OS platform, skip to the Creating a Photo Calendar section. 1 If it isn’t already open, launch the Photoshop Elements Organizer. 2 In the Organizer, type img in the search box. All the images that you will use in the slide show have the word img in the title. This is a great way to isolate them in the Organizer window. The search field is a good way to filter images. If you adjust the thumbnail size slider at the top of the Organizer workspace to make each image thumbnail smaller, you can display all 20 images on the screen at once. Note that if you’ve performed some of the previous lessons in this book, you may have more than 20 images. 3 Click the first file in the window, then hold down the Shift key and click on the last file in the window. This selects all images at once. You can also select all the images currently displayed in the Photo Browser by using the keyboard shortcut, Ctrl+A (Windows) or Command+A (Mac OS). 4 Select the Create tab on the right, and press Slide Show. 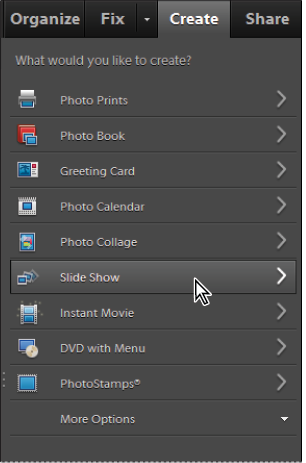 Because images were selected when you created the slide show, they are automatically included. Press the Slide Show button in the Create tab. 5 Press OK in the Slide Show Preferences dialog box that appears, accepting the default settings. The default settings allow you to create a slide show where each image is displayed for five seconds, and a two-second fade transition is applied between each picture. You may have to wait a couple seconds for the Slide Show Editor to open. You can use the Slide Show Preferences dialog box to define the parameters of the overall slide show—for example, how long each slide is visible, what type of transition you would like between the slides, and how the soundtrack behaves. All these settings are also editable individually from inside the Slide Show Editor. The settings in the Slide Show Preferences dialog box control the overall behavior of the slide show.